As the leading manufacturer of flexible shaft rotary power tools in the world, we also offer micromotors, bench lathes, handpieces, attachments, and accessories. 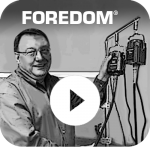 Foredom tools set the standard for quality, power and performance. We pursue continuous improvement and innovation to support the needs of our customers. Our flex shafts hang from jewelers benches around the world. These, and Foredom’s family of tools are a mainstay: machine shops, dental lab technicians, conservators, woodcarvers, artisans, hobbyists, scientific, engineering, aviation, high-tech businesses, educators and almost any custom fabricator.